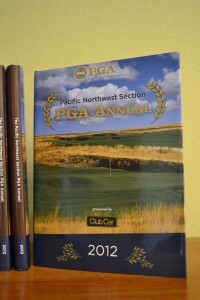 Each year the Pacific Northwest Section PGA publishes the Annual. This hard-bound book contains not only the winners of our Section and Chapter tournaments, but those of the amateur associations as well. 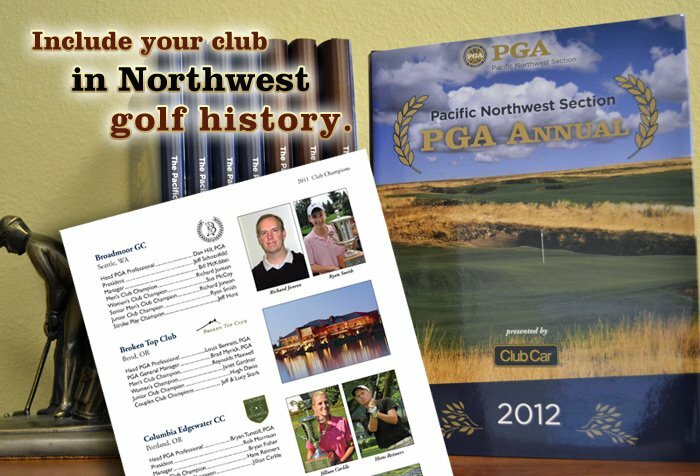 It is the best reference for results of PNWPGA, Pacific Northwest Golf Association, Montana State Golf Association, Oregon State Golf Association and Washington State Golf Association tournaments – all in one place for easy look-up, including photographs. For the third year in a row, the Annual is in beautiful full-color and it will also be available in e-PDF format for easy viewing on your computer or portable electronic device.Record your club’s champions alongside those of the PNWPGA and amateur association champions! View the 2012 e-PDF (large file, please give it a minute to download). With your listing fee of $200, we will publish your club name and logo, head PGA professional and two club officials as well as your club champions (for up to 9 lines total). We will also include a photo – what a great way to honor your Men’s Stroke Play and Women’s Stroke Play champions! Also consider including your PGA Junior Golf League team. To get an idea of what your listing will look like, check out the 2012 Club Champions. Your members will be thrilled to receive their copies of this beautiful, full-color book. Each book comes individually in a mailing sleeve so you can easily distribute copies to your members. You will receive one book per champion and official listed.